Food is an expression of culture. All cultures share the love of food, whether it is a collection of the familys favourite recipes, their memorable meals, or the rituals around collecting and preparing food. This common bond between people is a good place to start to learn about each others culture. Bannock, for instance, is a favourite food of First Nations on Turtle Island (North America) and all Canadians. The Bannock Awareness recipe book is a collection of favourite bannock related recipes (with a few others) and of little known facts about First Nations history and culture. In precontact times, bannock was made from natural substances gathered from the woods: flour from roots, natural levening agents and a sweet syrupmade from the sap of trees. Elders have warned me that today's reliance on "white foods" -refined sugar and flour- are contributing to an overal decline in the health of the people. While it would be impractical to return to the woods for all our sustenance needs, it is possible to chose healthier alternatives. Try substituting whole wheat flower and maple syrup or honey for sweeteners into the recipes for a more natural taste. Both parties prefer negotiation to litigation or confrontation. We can do our children a favour by learning about the history of the current conflict over rights to the land and celebrating some of our common interests, such as the love of a freshly deep-fried piece of bannock. I would like to thank all the contributors, Joyce Sam, Rhonda Ned, Reuben Blackwater, Del Blackstock, Thelma Blackstock and to Rhonda McAllister for helping me design and write this collection. The existence of the other side - There is no point in building a bridge to nowhere. The other side exists and has a right to exist. Solidity of both sides - The base or basis of a bridge must be accepted at both ends. Existence of a gap (river, canyon, etc.) - If there is only one piece of ground, there is no need for a bridge. The gap is not too wide to bridge - No one tries to build a bridge across an ocean. The gap is not too deep to bridge - Although deep gaps may exist - and they are very real and not mere illusions - still a bridge can be built. The value of a bridge - They are mutually helpful and beneficial. Bridges are costly but worth it. Sift together flour, baking powder, baking soda and salt in a mixing bowl. Stir in milk/water mixture and knead briefly with lightly oiled hands until smooth. Rub the remainder of the one tbsp of oil over the dough. Cover and let it sit for about 30 minutes. Pat or roll enough dough to fit in the palm of your hand in a circle about 1/8 thick (at least, a touch thicker is better). Deep-fry the dough in hot oil or shortening for about one minute per side, or until golden brown. Makes 10-12 pieces. The Aboriginal staff of life, Bannock, is common to the diet of virtually all North Americas first peoples. The European version of bannock originated in Scotland and was made traditionally of oatmeal. The bannock of Aboriginal people was made of corn and nut meal, and flour made from ground plant bulbs. There were many regional variations of bannock that included different types of flour, and the addition of dried or fresh fruit. Traditionally, First Nation groups cooked their bannock by various methods. Some rolled the dough in sand then pit-cooked it. When it was done, they brushed the sand off and ate the bread. Some groups baked the bannock in clay or rock ovens. Other groups wrapped the dough around a green, hardwood stick and toasted it over an open fire. Pioneers may have introduced leavened breads to the Aboriginal people. The use of leavened breads spread and adapted from there. Pioneers also introduced cast-iron frying pans that made cooking bannock quicker and easier. 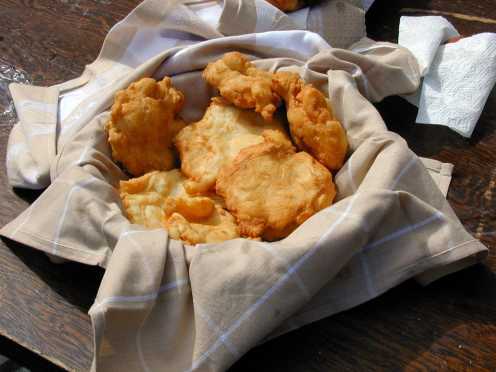 Today, bannock is most often deep-fried, pan-fried and oven-baked. Bannock is one of the most popular and widespread native foods served at pow wows, Indian cowboy rodeos, festivals, and family gatherings. Cook the Navajo Fry bread in cooking oil that has two tablespoons of limejuice added. Top the cooked bannock with: chilli, shredded strong cheddar cheese, shredded lettuce, chopped tomato and onion (sour cream and salsa are optional). Aboriginal peoples are defined as the descendants of the original inhabitants of North America. The Canadian Constitution of 1982 defines Aboriginal peoples to include First Nations, Inuit and Metis peoples. These separate groups have unique heritages, languages, cultural practices and spiritual beliefs. Their common linkage is their indigenous ancestry. The term "First Nation" came into popular use in the 1970s to replace the word "Indian", which some found offensive. The term Indian was first used by Christopher Columbus in 1492, believing that he had reached India. The term "Indian" is still used in various Canadian documents, most notable the Indian Act. There are three legal definitions of "Indian" in Canada (not to be confused with "Aboriginal"): Status Indians - those who are registered or entitled to be registered under the Indian Act. Non-Status Indians - those not entitled to be registered under the Indian Act. Treaty Indians - those belonging to a First Nation whose ancestors signed a treaty with the Crown and as a result are entitled to treaty benefits. First Nation is also often used to replace the term "band" in the name of communities. Sift together the dry ingredients. Cut in the margarine until the mixture resembles a coarse meal (at this point it can be sealed it in a ziplock bag for field use). Grease and heat a frying pan. Working quickly, add enough COLD water to the pre-packaged dry mix to make a firm dough. Once the water is thoroughly mixed into the dough, form the dough into cakes about 1/2 inch thick. Dust the cakes lightly with flour to make them easier to handle. Lay the bannock cakes in the warm frying pan. Hold them over the heat, rotating the pan a little. Once a bottom crust has formed and the dough has hardened enough to hold together, you can turn the bannock cakes. Cooking takes 12-15 minutes. If you are in the field and you dont have a frying pan, make a thicker dough by adding less water and roll the dough into a long ribbon (no wider than 1 inch). Wind this around a preheated green, hardwood stick and cook about 8 inches over a fire, turning occasionally, until the bannock is cooked. Pre-contact - Aboriginal and non-Aboriginal people lived on separate continents and knew nothing of one another. Years following first contact - Fragile relations of peace, friendship and rough equality. Power shifted to non-Aboriginal people and governments. They moved Aboriginal people off most of their lands and took steps to "civilize" them and teach them European ways. Presently, it is a time for recovery for Aboriginal people and culture, a time for critical review of our relationship, and a time for its renegotiation and renewal. Mix the dry ingredients together, add the blueberries and stir. Add the water quickly and continue to stir. Spread the batter on a pie plate and put in a preheated oven heated to 425°F. Bake for 20 minutes. Cut in pieces and serve hot or cold. Excellent served with mint tea. - This recipe comes from the Cappilano Reserve, Chilliwack, BC and belongs to the Shuswap people. 1492 - Christopher Columbus "discovers" America (believing he has landed in the "Indies", he describes the people as "Indians"). 1539 - Francisco de Vitoria proposed that Indians own the lands they occupy. 1763 - A Royal Proclamation outlines the basic principles of Canadian Indian Policy: recognition of Indian lands, recognition of Indian governments and provision of a treaty process with the crown. 1867 - July 1, the British North America Act is passed making Canada a nation. Constitution Act was written. 2. Creation of band councils which replace and undermine the authority of traditional tribal governments. 1872 - Residential schools are set up. 1876 - The Governor General, the Earl of Dufferin, gives a speech in Victoria condemning the BC government for not recognizing Indian title. 1880 - Indian Act amended to provide for the automatic enfranchisement of any Indian who earns a university degree, and any Indian woman who marries a non-Indian or an unregistered Indian. 1885 - Canadian Government sends in troops to crush the Riel Rebellion in Saskatchewan. Nov 16: Louis Riel, after this second Metis "rebellion" and in spite of a recommendation for mercy from a jury, is hanged in Regina. 1900 - Genocide has reduced the indigenous population north of the Rio Grande, estimated at 12-15 million in 1492, to 300,000. 1915 - the first pan-tribal organization in BC, The Allied Tribes of BC, is created to address the "the land question". 1927 - The Federal government makes it an offence punishable by imprisonment to raise money to press for land claims. 1944 - The North American Indian Brotherhood is formed to unite Indians in Canada. 1947 - First Nation people are given the right to vote in provincial elections. 1951 - Parliament repeals legislation prohibiting potlatches and the pursuit of land claims. 1960 - July 1, Indian people win the right to vote in federal elections. 1973 - Calder Case - rules that the concept of Aboriginal title is part of Canadian law. 1973 - A federal policy for settlement of Aboriginal Land Claims was established (see Land Claims section). 1978 - Metis and Non-Status Indian organizations receive funding to research potential claims. 1982 - Section 35 is inserted into the Constitution Act affirming the existence of Aboriginal and treaty rights. It includes Indian, Inuit and Metis peoples in the definition of "Aboriginal peoples of Canada". 1984 - The Gitxsan and Wetsuwten initiate their claim in BC Supreme Court for ownership, jurisdiction and self government over 58,000 km2 of traditional territory. 1985 - Bill C-31 (amendment to the Indian Act) is passed. It removes the discrimination, restores status and membership rights, and increases the control of Indian bands over their own affairs. 1987-1990 - Gitxsan and Wetsuwten trial takes place in Smithers and Vancouver. 1990 - Failure of the Meech Lake Accord. 1990 - BC joins Canada and BC First Nations in treaty Negotiations. 1990 - BC Claims Task Force was formed by Canada, BC and BC First Nations. 1991 - BC Supreme Court Justice Allan McEachern rules in the initial Delgamuukw decision that aboriginal interests do not include ownership of or jurisdiction over the disputed territory. 1991 - One of the key recommendations from the BC Task Force report is the establishment of the BC Treaty Commission to oversee the treaty process. 1991 - Royal Commission on Aboroginal Peoples (RCAP) was established with a 16-point mandate and consisting of four Aboriginal and three non-aboriginal commissioners. 1993 - BC Court of Appeals five judges unanimously ruled in the appeal of the 1991 Delgamuukw case, that native rights were never extinguished by the colonial government before confederation and that the rights are protected in the constitution. This ruling is known as Delgamuukw 2. 1993 - BC Treaty Commission was established. 1994 - The Supreme Court of Canada agrees to hear a further appeal from the Gitxsan and Wetsuweten but is adjourned until June 1995 pending negotiation. 1996 - Negotiations break down between federal and provincial governments and Gitxsan negotiators. 1996 - A five-volume Final Report of the Royal Commission of Aboriginal Peoples was released with 440 recommendations. 1997 - The Supreme Court of Canadas Delgamuukw 3 decision orders a new trial that fundamentally alters the legal relationship between aboriginals and government. It recognizes the existence of Aboriginal rights and title, and the right of First Nations to derive an economic interest in traditional territory. 1999 - Nunavut becomes a territory on April 1 with its own public government. April -The Nisga'a Final Agreement passed with a free vote witin BC Government. September - Westbank Indian Band commences harvesting on its traditional territory. Interior Alliance prepares to launch an international consumer boycott in the United States and Europe of forest products from BC. The Interior Alliance and the Union of BC Indian Chiefs supports the Okanagan Nation at Westbank in its timber harvest operation. A BC Supreme Court Judge declines to stop Westbank Band. The Judge ruled that the issue of Aboriginal and Crown title should be quickly dealt with. Adams Lake, Neskonlith and Spallumcheen bands commence timber harvesting on traditional lands in the Harper Lake area. Nuxalk Nation (Bella Coola) starts harvesting. The Interior Alliance confirms that all the area in the south central Interior of BC is subject to the Aboriginal title of Interior Alliance nations and is directly affected by the Delgamuukw decision. October - Province issues stop-work orders at the Harper Lake logging site and steps up its fight against "unauthorized" Native logging. 2000 - The Nisga'a Final Agreement received Royal Assent from the Government of Canada. - Colonialism on Trial (1992), Aboriginal Workforce Participation Initiative (1998), Secwepemc News, Oct. 1999. Put the sunflower seeds, water and salt into a pot, cover and let simmer for 11/2 hours. When well cooked, crush the seeds to make a paste. Add the corn flour, 1 tbsp at a time to thicken. Work with your hands; cool a little. Make small, flat pancakes of approximately 5 inches in diameter. Heat oil and fry both sides, adding more oil if necessary. Drain well and eat. DO NOT PREHEAT YOUR OVEN!!!!! Turn the oven to 425°F and bake for 25 minutes. Raise the rack to the top for the last 5 minutes. GOOD LUCK! Mix ingredients together and pour onto a lightly greased (with margarine) cookie sheet. Bake in oven at 450°F for 20 minutes. Cut it right away into squares. It is good with soup or as a snack. Mix dry ingredients together. Cut in shortening and then stir in milk. Form a ball of dough using flour to prevent sticking to hands. Roll into a square approximately 2 thick. Mark with squares (by making shallow cuts into the dough so cutting is easier after it is baked) and bake at 350°F for about 1/2 hour. Combine all the ingredients until they are thoroughly mixed. Pinch some of the dough and shape it. Fry it in hot oil until golden brown. Combine berries and water. Cover and cook over low heat until berries are soft. Crush them as they are cooking. Press berries through a food sieve or mill. Add sugar, lemon juice and salt. soak gelatin in water for 5 minutes. Add to hot puree. Cool. Pour into large container or bowl and freeze until half frozen. Remove from freezer and beat until fluffy. Fill small containers 3/4 full with mixture. Cover tightly and freeze until firm. Store until needed. YIELD: 1 gallon. Blueberry Velvet can be thawed and stirred into vanilla cream, used as a sauce, or beaten into cream cheese for a sandwich filling. Frozen, it is a sherbet to be scooped out and put over cake, friut and added to fruit juices. First Nations used controlled burning as a means of habitat manipulation to maximize production of fruits, edible roots and trees. The Thompson (Nlakapamux) were also known as "Couteau" or "Knife" Indians. First Nation botanical terminology represents a real link between language, culture and the environment and may provide insights into the relationships between past cultures and their environment. Tree lichen had many uses: It was a food source as well as a medicine; it was used for traditional costumes; for chinking cracks in houses; as a dye for hides, wood, mountain goats wool and horsehair; and it was also used for face paint by some pubescents. Plant foods were preserved by threading them onto to strings of bark or grass and hung to dry. Most were dried in the presence of smoke to deter flies and other insects. Strung dried plants were a common trading item. It turns into a hardened licorice tasting "bannock". It can be cooked with berries like saskatoons to add sweetness and flavour. In general, Aboriginal people are required to pay taxes, except where limited exemptions apply (outlined below). The Tax exemptions originate under Section 87 in the Indian Act, not under the Revenue Canada Tax Services office. The goods or services will be delivered to a reserve. All work is performed on a reserve. Most or all work is performed off reserve, but the First Nation person lives on a reserve and the employer is a resident on a reserve. Some of the work is performed off a reserve, but most of the work is on reserve and either the employee or the employer is a resident on a reserve. An Indian organization controlled by a band or tribal council that has a reserve, or that represents one or more bands that have reserves. All other Status Indians are required to pay income tax. Inuit and Metis are also required to pay income tax and all other taxes. Heat frying pan with 1/4 inch of canola oil. Combine all dry ingredients. Make a well in the middle and add water. Stir until the dough is a thick batter (It will be a gooey mess). Drop a generous tablespoon of dough into the heated pan; spread the dough to 1/2 inch in thickness (use a spoon and fork for this step). When the bannock is puffed and brown on one side (yes, peek if you wish), then flip it over and brown it on the other side. Smother with favourite toppings - Rogers Golden Syrup, honey, peanut butter, jam or jelly or even a taco filling. You may also sprinkle it with a sugar/cinnamon mixture (1part cinnamon to 10 parts sugar). The division of claims into two broad categories - comprehensive and specific. Specific land claims - those that arise from alleged non-fulfilment of Indian treaties and other lawful obligations, or from the alleged improper administration of lands and other assets under the Indian Act or other formal agreements. Because of the difficulty and length of time to come to some resolution, the federal government created the Indian Claims Commission (1991) to provide a forum for hearing disputes over specific claims. The Commission can make recommendations. It can also provide a facilitator to assist the First Nations, provincial government and federal government to come to a decision, but the final decision is with the Minister. In 1990, the federal government announced the elimination of the six-claim limit. Preheat oven to 450°F. Grease lightly a cast iron frying pan, or baking sheet. Stir and blend together the flour, baking powder and salt. With a pastry blender or two knives, finely cut in the lard. Then gradually stir in the water. Stir with a fork to make a soft, slightly sticky dough. Turn dough on a lightly floured surface and knead gently 8-10 times. Roll out or pat 1/2 inch thick, or flatten dough to fit frying pan. Cook in frying pan on hat ashes over an open fire (turning to brown both sides), or on a baking sheet in oven for approximately 12-15 minutes, or until golden brown. Cut and serve with butter. Makes 1 loaf. Feast/Potlatch - The potlatch ceremony illustrates the importance of sharing and giving. This ceremony was the cultural backbone of the Northwest Coast Aboriginal Peoples. High-ranking chiefs, to celebrate important public events such as initiation, marriage, the investiture or death of a chief or the raising of a totem pole, hosted a potlatch. The ceremony lasted anywhere from a day to several weeks, and involved feasts, spirit dancing and theatrical performances. In 1884, the Canadian government banned potlatch ceremonies, questioning their moral basis. The ban was lifted in 1951. Pow-wow - An ancient tradition among some Aboriginal people to celebrate and socialize after religious ceremonies. It is now common for pow-wows to be held throughout BC, however, in some areas the pow-wow is a relatively new kind of celebration. In some cultures, the pow-wow itself was a religious event when families held naming and honouring ceremonies. In a bowl, stir together dry ingredients. Cut in lard until mixture resembles a fine meal. Make well in centre, pour in soured milk and stir using light strokes, just until liquid is absorbed. Knead lightly 5-6 times to make a smooth dough; set aside. In large heavy skillet, melt just enough lard to thinly coat bottom of pan. Heat pan over medium heat for 5 minutes. Divide dough into 6 portions; shape into flat, round buns about 3/4 inches thick. Arrange in pan (in batches if necessary). Cover and cook for 6 minutes or until bottoms are deep golden brown. Turn buns, replace cover and cook for 6 minutes longer. Remove to rack and let cool before serving. *To sour milk: Add enough milk to 1 1/2 tsp vinegar to make 1 cup. Aboriginal rights - Rights that some Aboriginal peoples in Canada hold as a result of their ancestors long-standing use and occupancy of the land. The rights of certain Aboriginal peoples to hunt, trap and fish on ancestral lands are examples of Aboriginal rights accorded either through treaties or formal agreements. Aboriginal rights vary from group to group depending on the customs, practices and traditions that form part of the groups distinctive culture. Place water in a mixing bowl, sprinkle yeast over water and allow to sit for 5 minutes. Add butter, sugar, and 2 1/2 cups of flour and salt. Knead, adding enough flour to form a stiff dough. Allow to rise for one hour. Place oil in a deep saucepan and heat to 350°F. Form dough into cakes approximately 4 inches in diameter and about 1/4 inch thick and deep fry for about one minute per side or until golden brown. Makes 8-10 pieces. The Metis are one of three distinct Aboriginal peoples of Canada (Inuit and Status Indian are the other two), recognized by the Canadian government. The word Metis comes from the Latin "miscere", to mix. It was used originally to describe the children of Native women and French men. Other terms for these children were "Country-born, Black Scots, and Half-Breeds." The Metis were instrumental in the development of western Canada. They quickly became intermediaries between European and Indian cultures, working as guides, interpreters, and provisioners to the new forts and trading companies. Their villages sprang up from the Great Lakes to the MacKenzie delta. The Metis homeland encompasses parts of present-day Ontario, BC, the Northwest Territories, Alberta, Saskatchewan and Manitoba. Metis culture was a combination of French, English and Indian influences that took root and flourished. The Metis developed a unique language called Michif that has Cree-French roots. Metis dress included woven sashes, embroidered gun sheaths, deerhide hats, and quilled and beaded pipe bags. The Metis logo is an infinity sign. The First Nations (and Metis) used pemmican as a trail food. It keeps well for long periods of time. Run dry jerky through a food grinder a few times until it is the consistency of fine meal. For each pound of jerky meal, add 2 ounces of raisins and 2 tablespoons of brown sugar. When the mixture is well blended, melt the suet and stir it in. The result, when the suet hardens and cools, is pemmican. There are many variations of this simple theme. Soapberry (also known as Soopolallie) shrubs are nitrogen fixers. This means they have special bacterial nodules on their roots that allow them to capture nitrogen from the atmosphere and release it into the soil where plants can make use of it. Interior First Nations whip the berries with a little water into a light foam to make a nutritious and refreshing "ice cream." The berries are high in iron content and were eaten fresh, dried, or boiled into a syrup for use as a drink. *Make sure the berries, bowl and utensils dont come into contact with grease or oil because it will not whip and become nice and fluffy. Silverberry bark - by tying a loose bundle of shredded bark on to a handle. Rocky Mountain Maple - the fibrous bark was used with no handle. Pinegrass - the roots were cut off and the leaves used to whip. Loose bundles of bark and pinegrass held in the hand was more difficult than using a whipper with a handle. Whipping was started at the top of the mixture then slowly lowered down into the bowl until the mixture was all fluffy and well incorporated. Sometimes just the hands were used for whipping. Whippers could be washed and reused. Boil soopalallie berries, strain the juice and preserve by canning (canned soapberry juice will keep for about 3 years if sealed well). Later sweetener and water are added to the juice to make a thirst quenching juice. Honey or dried saskatoon berries can be used as a sweetener over sugar. In 1996, Governor General Romeo Leblanc proclaimed June 21, National Aboriginal Day to honour First Nations, Inuit, and Metis cultures, and to recognize the many contributions Aboriginal peoples have made to Canada. 1982 - the National Indian Brotherhood (now the Assembley of First Nations) adopted a resolution calling for the "creation of June 21 as National Aboriginal Soldarity Day". 1990 - the Quebec legislature was the first in Canada to recognize June 21 as a day to celebrate Aboriginal Culture. 1995 - the Sacred Assembly, a national conference of Aboriginal and non-Aboriginal people, chaired by Elijah Harper, called for a national holiday to celebrate the contributions of Aboriginal peoples. June 13, 1996 - during a ceremony at Rideau Hall, the former Governor General declared June 21 as National Aboriginal Day after federal consultations with various Aboriginal groups.